One foggy November morning on Chicago’s West Side, paramedic trainee Beth Reilly faces a life or death choice that will put her own future in jeopardy. High on cocaine, her veteran paramedic officer slams into a homeless, pregnant woman, forcing the woman into labor. 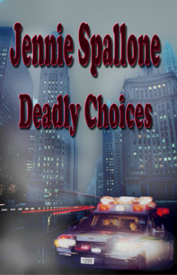 Beth alone must decide who will live, the fetus fighting for life or the mother who is hemorrhaging to death. She can’t save them both. Beth’s decision tests old friendships and creates new enemies. Her woman hating boss tries to destroy her career. An ambitious prosecutor decides her trial is his ticket to a judgeship. A religious zealot treats her as a sacrificial lamb, diverting suspicion from the woman he loves. A handsome professor enters her life, but is the timing coincidental? When one of her tormentors dies suspiciously, Beth realizes her choices have turned deadly.